One of the eternal challenges of economic development is how to identify the economic activities that a country, city, or region should target. During recent years, a large body of research has shown that countries, regions, and cities, are more likely to enter economic activities that are related to the ones they already have. For instance, a region specialized in the exports of frozen fish and crustaceans can more easily start exporting fresh fish than heavy machinery. This research has illuminated a new chapter in the economic development literature, but has left an important question unanswered: what is the right strategy for countries wanting to diversify their economies? Economic diversification has become an important development goal among medium-income countries, especially among those relying on the export of commodities such as Chile, Peru, Saudi Arabia, and Kazakhstan. Given past research, the obvious intuition is to follow a pragmatic strategy focused only on related activities. But our research with the Masdar Institute in Abu Dhabi shows that this intuition may be flawed. We used mathematical models and simulations to compare multiple economic diversification strategies. What they found is that always targeting the “low-hanging fruit”—related activities—is not the optimal choice. Instead, the researchers found that countries can do better by using dynamic strategies, targeting related products at the beginning and the end of the development process, but switching to targeting more unrelated activities when they reach an intermediate level of development. At this critical point, the future diversification opportunities—opened by an unrelated activity—compensate for a country’s reduced probability of success in it. Although counterintuitive, sometimes, targeting an activity that is not the easiest to develop accelerates the process of economic diversification. At low levels of economic development, targeting unrelated activities may be too hopeful. But when economies enter an intermediate level of development, it is optimal to take larger risks and target activities that are relatively unrelated. So the important question for countries is when to switch strategies. But the idea of dynamic strategies is not only interesting for economic development, it is also a contribution to network science. We have formalized the problem of identifying optimal economic diversification strategies as a problem of strategic diffusion in networks. For the most part, researchers working on network diffusion have been using strategies focused on nodes with specific characteristics, like highly connected or central nodes. Our results show that in this case, those strategies are far from optimal, since the optimal strategies need to change which nodes to target at each step. But the research was not limited to only finding the theoretical optimum. It also compared the theoretical strategies with the empirical behavior of countries, as they diversify their products and research activities in the networks of related products and research areas. Germany, the United States, and South Korea are examples of three economies with high levels of complexity and large and diversified product portfolios. Conversely, Angola, Paraguay, and Bangladesh are low-complexity economies with few developed products. According to our findings, countries at these two extremes should continue to develop products or activities that work for them. For instance, Germany would benefit from continued development in fields where they have shown success: chemicals, health products, and aircraft parts while Bangladesh should continue to target products in the garment, textile, and agriculture sectors. The reasons why countries at these two opposite extremes would benefit from the same development strategy are arguably different: highly developed economies would be looking to specialize their industrial capabilities; underdeveloped ones to consolidate local knowledge before taking risks. In contrast, countries such as Malaysia and Turkey are between these two extremes. In an intermediate stage of diversification, these countries would benefit from developing activities unrelated to their current product portfolios. This means moving away from garment manufacturing and perhaps investing in machinery and chemicals or health-related products. Export Basket of South Korea. Boxes (left) highlight past emphasis of its economy in electronics and garments. Arrows (R) point to unrelated developments allowing its growth to a complex economy in the early 2000s. Looking back at the development of countries, there are examples of countries that succeeded or failed to enter unrelated activities at the right stage, and how it impacted their economic development. 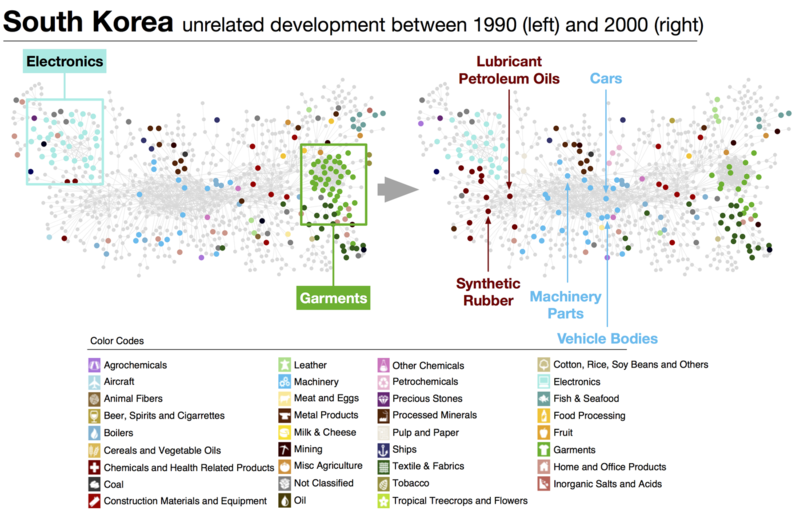 For example, South Korea experienced an industrial transformation over the past 50 years moving away from textiles in the early 1970s to one dominated by products in electronics and machinery. The booming in South Korean economy, and the speedup of its economic complexity, coincided with a series of unrelated developments in the late 1990s, that targeted products in the Machinery sector (e.g., cars, vehicle bodies, non-electrical machinery parts).